One of my favorite writers, Gore Vidal, once described his country as the United States of Amnesia. “We learn nothing because we remember nothing,” he wrote. Vidal’s point is simple enough: America’s concept of itself is shaped by mythology, not by facts. And it’s harder to address mistakes if you’re unwilling to face them honestly. In 1995, James Loewen set out to resolve this problem. He published a landmark book, Lies My Teacher Told Me, that went on to sell more than 2 million copies. Loewen taught race relations for two decades at the University of Vermont, and spent two years at the Smithsonian Institution, where he surveyed past American history textbooks. The result of his research was a massive tome that pointed out all the distortions and falsehoods taught in US history classes. Like Howard Zinn famously did before him, Loewen shattered myths around Christopher Columbus, the first Thanksgiving, the Civil War, Helen Keller, Abraham Lincoln, American labor history, and the roots of racial inequalities. The problem, Loewen argued, was our impulse to turn historical events and figures into “moral examples,” which usually involved whitewashing the past in order to reinforce a familiar story about American greatness. According to your book, the biggest lie we are taught in US history class is that the country started out great and we’ve just been getting better ever since. But on a long enough timeline, isn’t this partially true? It’s true enough. My problem is the implication that progress is automatic, which it most certainly isn’t. Second, the idea that we’re always getting better keeps us from seeing those times when we’re getting worse. Consider the period of 1890-1940, when race relations got systematically worse every year. America actually got more racist in its ideology than at any other time in history. After slavery, white people convinced themselves that there were equal opportunities, which was a lie. They told themselves that black people were criminals and incompetent and unable to succeed. The point isn’t that life was better for people under slavery; it’s that the story of moral and political progress isn’t so clear. And when we pretend that it is neat and clear, we cause teachers to teach and students to think that progress happens automatically, and that destroys the impulse to change things — to become an activist. What’s the most consequential lie we teach? That’s an interesting question. I’d go back to 1892, 400 years after Columbus is said to have discovered America. If you looked around the world at that time, white people dominated most of it. The big lie is our failure to ask how that came to pass. We simply assumed that we dominated because we were better, or smarter, or worked harder. So much of what has passed as “history” since has been invested with white supremacy, even though the reasons why history unfolded the way it did are extremely complicated and have to do with luck, and geography, and all sorts of factors that aren’t captured in our oversimplified narratives. We never seriously asked the question, and so white supremacy became the default answer. What could be more consequential than that? Is a truly authoritative version of history ever possible? Isn’t history always a self-serving narrative shaped by actors who are deeply invested in it? Everything is not a matter of nuance: everything is not up for grabs. It is simply true, for example, that the South seceded from the Union because of slavery, and not because of states’ rights. We know this to be true, and an alternative version of history that denies this is a lie. Period. 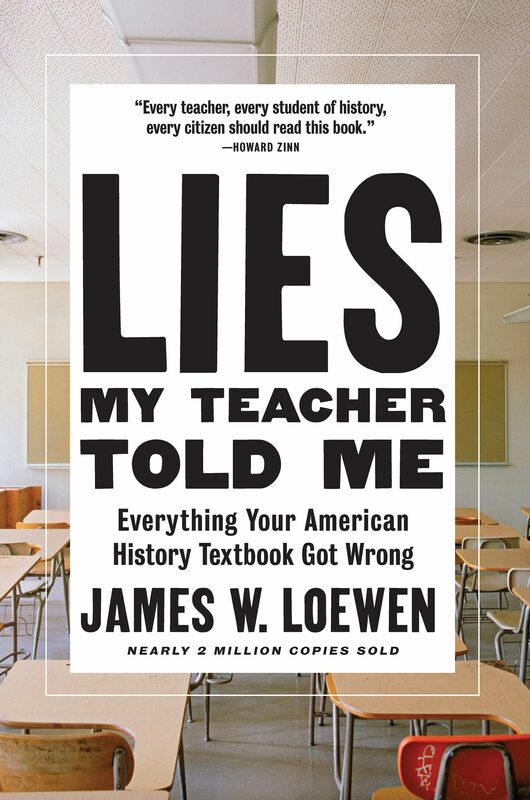 Why do high school history teachers continue to assign books that they know are filled with falsehoods? I think a lot of them don’t even know they’re filled with lies. Many of them, it turns out, aren’t historians and haven’t taken a single course in US history in college. And yet here they are, teaching US history at the K-12 level. If you don’t know any history, then you don’t know enough to teach the book and to say the book is lousy. Not only that, you have no interest in doing so because you’re relying on it. You’re using it as a crutch. You are teaching the book instead of teaching history, using the book. That’s a profound difference. What do you mean when you say that some history textbooks are “anti-citizenship manuals” or “handbooks for acquiescence”? That gets back to the point about progress. I think that textbooks fail to teach what causes what. Everything is just one damn thing after another. You need to learn all those little facts. Therefore, they fail to impart the idea that we, as people, should be trying to achieve things, things that won’t happen without our efforts. For example, if we want to make our society less racist, there are certain things we’ll have to do, like we did between 1954 and 1974. During this time, you could actually see our society become less racist both in attitudes and in terms of our social structures. If we want to make society more racist, then we can do some of the things we did between 1890 and 1940, because we can actually see our society becoming more racist both in practices and in attitudes. So by not teaching causation, we disempower people from doing anything. By teaching that things are pretty much good and getting better automatically, we remove any reason for citizens to be citizens, to exercise the powers of citizenship. But that’s not how progress happens. Nothing good happens without the collective efforts of dedicated people. History, the way it’s commonly taught, has a way of obscuring this fact. The preface to your latest edition addresses the problem of truth in the age of Trump. How would you analyze what’s happening right now? I actually think our situation is far worse than it was in the past. For example, our federal government, under Nixon and Johnson, lied to us about the Vietnam War, but they never made the case that facts don’t matter or that my facts are as good as your facts. They assumed something had to be seen as true in order to matter, so they lied in order to further their agenda. Trump has basically introduced the idea that there is no such thing as facts, no such thing as truth — and that is fundamentally different. He is attacking the very idea of truth and thereby giving his opponents no ground to stand on at all. That’s a very dangerous road to go down, but that’s where we are. California’s huge energy decision: link its grid to its neighbors, or stay autonomous?